[War God Advent] brings back past Giant Kabuto who use special skills, unleashing their true power as they assault Tono and his castles. Furthermore, this War God Advent has reduced automatic [Ki] regeneration, and it is a super high difficulty map that exceeds [E-X1&2] maps. 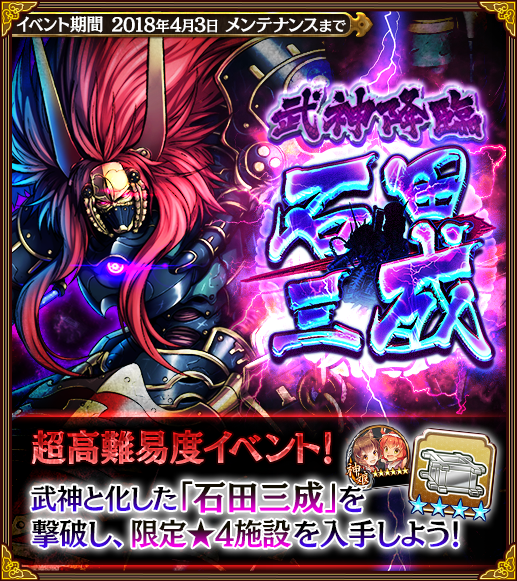 Clearing the special requirements of the War God Advent awards the 『★4千貫井』 facility, and [Tsubasa & Byakusen]. The map terrain is Plains. ※ Requires Tono Level 30, and the 16 AP Story map cleared. 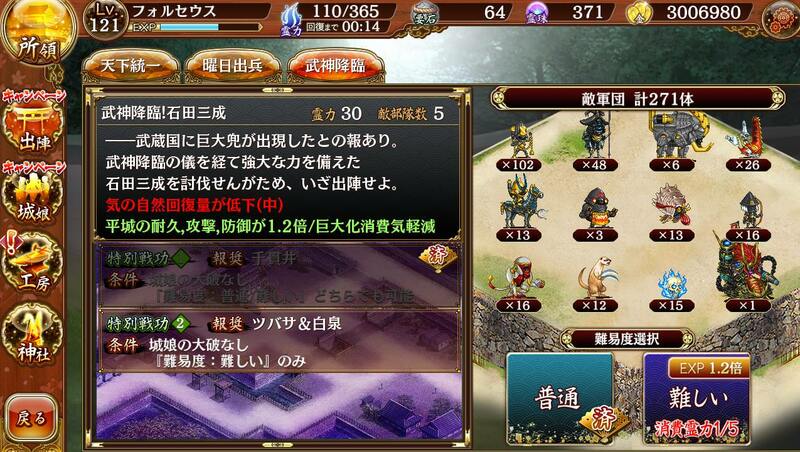 [Tsubasa & Byakusen] give +30 000 EXP when combined with a castle or a building. Natural Ki generation is reduced, meaning Ki generating tokens also have less effectiveness. Usuki, Bicchuu-Matsuyama, del Monte, Yanagi-no-gosho, and Konki have stratagems that increase Ki on kill, which are very useful and probably necessary. 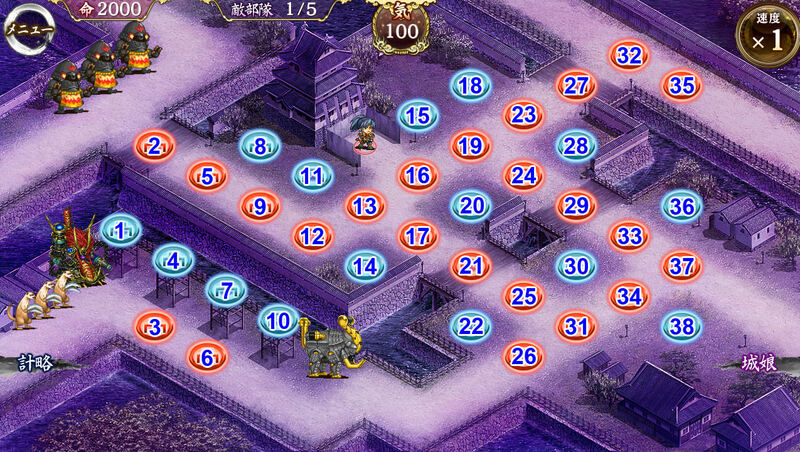 That being said, it appears that this map is designed for it to be more difficult to manage Usuki's token on. Normal is significantly easier than Hard mode due to the massive damage spike from enemies. The kamaitachi (weasels) do a significant amount of damage as they run through. It is highly recommended to have a Song and/or Bell and Talisman or Shield to stop them. A Shield will need lots of healing to be able to tank them. It is also recommended that Tono be in range of a Song and Talisman so he can tank and be healed when will-o-wisps and even kamaitachi walk into him. 20 is a good spot for a Talisman in this regard. The sumos can be tanked on Normal but they will do too much damage on Hard. You can snipe them from 8 with a Gun or Cannon or from 2 with a Spear. Guns will have difficulty in Round 2 when more enemies spawn on the path and take the hits. They otherwise take the north path and reappear from the top right and walk 32-27-23-19-16-Tono. Ishida doesn't actually do a lot of damage before transforming. 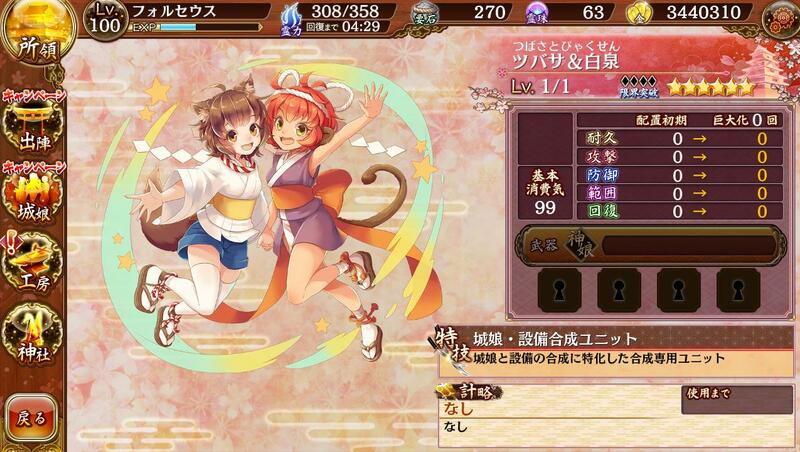 After the first HP bar though, the attacks will also have a splash effect and all enemies gain +300 DEF and +30% HP. It is highly recommended to use a Shield as far away from a Song as possible so she can be healed without killing anyone nearby. On Normal, you can probably brute force heal through the splash damage but it is likely impossible on Hard. I believe tokens either get targeted even if you're blocking with a Shield, or the splash is just big enough that most flags will get caught. Cleared Normal, didn't do Hard. Iwadonoyama's stratagem is super useful. I placed her first, then used her strategem on the weasels and Ishida which killed or severely wounded the weasels and placed Ishida's health low enough for one use of Nagoya's stratagem to start off her second phase early. After that I retreated her and only brought her out again in the 3rd round once the 4 floating skulls in a square were gone (8 is only safe for the first round). Maxed Forbidden City early, then Jurakudai, then Gin-jou for overlapping buffs. 20 (Osaka) needs to be strong enough in the beginning to survive the enemy bows. After the 4 floating skulls in a square and the large monkeys that run in through 35-32-37 are gone, 38 is safe for Iwadonoyama. Once the 3rd sumo is eliminated (near the end of round 4) then I used Iwadonoyama stratagem on Ishida and the second batch of weasels again, which will trigger off Ishida second health bar. Ishida will come out early which is good, so he doesn't survive till the end when 3 elephants attack at the same time. After Iwadonoyama uses her stratagem the second time I retreated her so she didn't die accidentally. Whatever is at 14 needs to have enough DPS to kill Ishida and be able to survive some hits from Ishida as well. 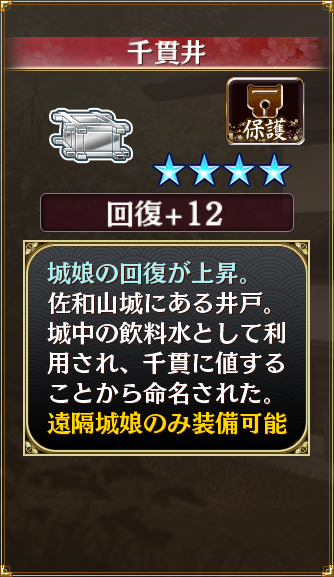 I used a combination of Sant'Angelo's damage block, Forbidden City and Osaka decoy tokens and 2 overlapping healers to make sure Jurakudai survived, and Gin-jou debuff for damage.